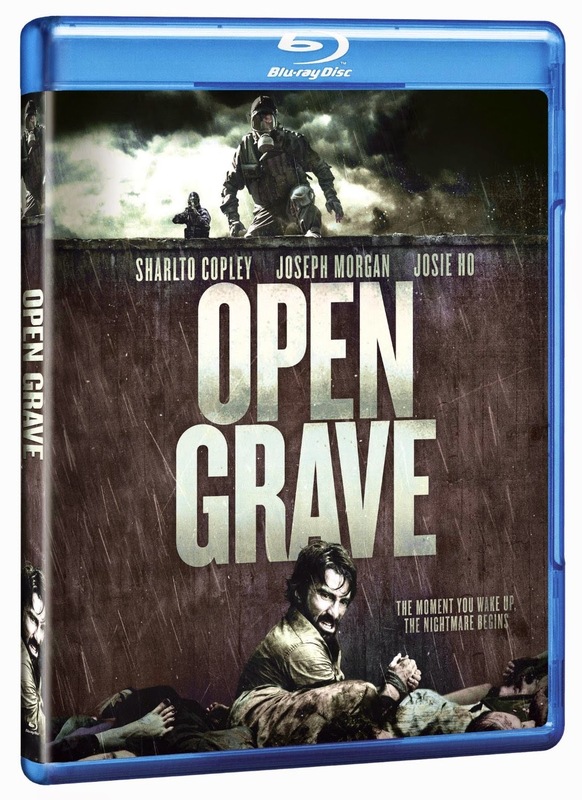 Featuring genre favorites Sharlto Copley (District 9, Elysium) and Joseph Morgan (“The Originals,” “The Vampire Diaries”), the zombie apocalypse film that takes psycho thrillers in a new direction, Open Grave, awakened on Blu-ray and DVD July 15 from Cinedigm and Tribeca Film. 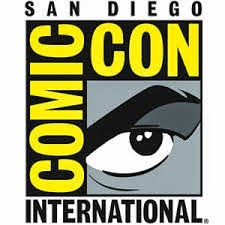 Directed by Gonzalo López-Gallego (Apollo 18), the dark and twisted thrill ride also stars Thomas Kretschmann (Wanted, Resident Evil: Apocalypse), Josie Ho (Contagion), Erin Richards (The Quiet Ones) and Max Wrottesley (“24: Live Another Day”). A complicated story that pits characters against each other, Open Grave examines how important memory is to a person’s identity by forcing six strangers—stripped of all recollection—to confront their inner demons. 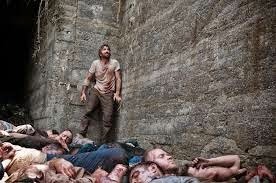 A man wakes up in a pit of dead bodies with no memory of who he is or how he got there. Fleeing the scene, he breaks into a nearby house and is met at gunpoint by a group of terrified strangers, all suffering from memory loss. Suspicion gives away to violence as the group starts to piece together clues about their identities, but when they uncover a threat that’s more vicious and hungry than each other, they are forced to figure out what brought them all together—before it’s too late. 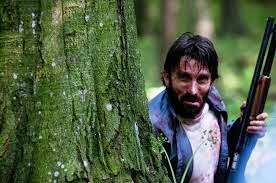 It’s Walking Dead meets World War Z (the movie, not the book) when a man wakes up in a ditch full of dead bodies, having no recollection of who he is, or how he got there. He calls for help and a woman throws a rope down to him. Climbing out, he sees the woman has disappeared, but finds a house and enters. In the house, five people are trying to figure out who they are and what’s happening around them. After emptying their pockets and figuring out some of their names, the six people try to piece things together by looking around the house, but all they find is a gun cabinet, a calendar with the 18th of the month circled, and a locked iron door. 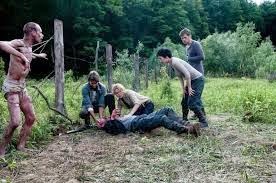 After following a member of the group, a woman who does not speak, to a shack in the woods, the groups finds the woman feeding another woman who is chained to the walls. After further investigation throughout the next day, the group slowly begins remembering pieces of their individual lives. Jonah, the man who woke up in the ditch, is having vivid memories or terrible things he may or may not have actually done. As he tries figuring out who he is and what he’s done, the others find a videotape of Jonah performing experiments on them. On the last night, when Jonah and the others finally get their memories back, Jonah, realizing time has run out, rushes back to the house to find everyone. But he’s too late… the 18th has come, and with it, the Army. The Army cleans up the mess at the house, and Jonah, after hiding once again in the ditch full of bodies, barely escapes with his life. There’s so much more I could say about this film, but at the risk of spoiling it, I’m going to leave it generalized. It was a little more than a typical movie of the same genre, and I really liked the story. It wasn’t as predictable as I thought it might be and I really enjoyed it. The decisions made by the director worked well and the actors were all believable in their roles. The writing was smart and the dialogue sharp and well done by the writers. Open Grave’s widescreen 16x9 presentation was really good. The colors were really bright, especially the greens on the trees and grasses. Scenes were bright or muted as necessary, blood was not too red, and night scenes were natural and not too blue. I really liked this film on Blu-ray. The Dolby Digital 5.1 Surround Sound for Open Grave is good. Most of the dialogue is somewhat quiet, and then there are gunshots, people yelling, screaming or other sounds that are so loud I had to adjust the volume every time. I actually held the remote in my hand for the full 100 minutes. The dialogue, when audible, was clear. Audio in Dolby Digital 2.0 Stereo, with subtitles in English for the deaf and hard of hearing are also available. I was really disappointed in the special features on the Blu-ray disc. I hoped for more because I was interested in learning more about how this film and story began. Behind-the-scenes-featurette – A four-minute behind the scenes look at the film, featuring interviews with the cast. It was interesting, but I wish it was longer and more in depth. 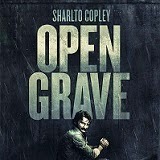 Open Grave is a good movie. It’s a suspenseful story where, in addition to the viewer trying to figure out who is who in the film, the characters are doing the same thing. You learn at the same time as the characters. I thought that was an interesting idea and think I enjoyed the movie more than if I could figure everything out. Open Grave is definitely a movie I will keep in my library and watch again.